As some of you may have already noticed, we have created a wiki page for our server. The purpose of this new wiki is to fill it with all kinds of information regarding DreamerRO. Although we already have quite a resourceful guides section on the forums, we believe that the new wiki will make it much easier to find the information you are looking for. Our wiki is still under construction and lacking a lot of information, but we believe it already has quite a lot of valuable information for our players. I'd like to ask every Dreamer to help us out by sharing your knowledge on our wiki. Tips and Tricks regarding DreamerRO and Ragnarok as a whole. We encourage all our Dreamers to share pretty much any kind of knowledge you think may help other players. If you see any guide that has incorrect information or lacks important details, please feel free to edit the page and add that in. We have records and logs of every change to any page in our wiki and we can easily recover or rollback any changes to any page. 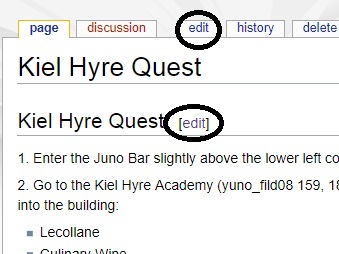 If you believe your guide is good enough to be featured in the wiki's main page or posted in the jobs section, please open a support ticket so a staff member can process your request. As I mentioned previously, the wiki is still under construction and we are adding new content to it on a daily basis. We are asking for you help to make the wiki more complete each day! For now, please help me thank the main volunteers who have helped adding guides to our wiki! Click here to visit our new wiki! you guys putting updated guides on wiki? That is the goal, yes. What if we want to alter an existing guide to make it updated to the current times and send it in as a new guide like in hero quest? would we be okay with doing that? One more thing. can we have a night mode in the wiki website? similar to the forums, i prefer it black/dark. When you are on a page, you can click on "edit" next to "discussion" this is to edit the whole page. At times there will be section you can edit like the 2nd circle on the bottom, that's to edit only for that section. will our names be posted when we make a wiki link? will it get stolen by others? of course we want to make sure what we worked hard to type isnt credited to someone else u get what i mean? also wanna ask if we can make wiki entries abt custom monsters rms style? will our names be posted when we make a wiki link? Your account name should be displayed beside the edit on the Recent Changes and Contributions section. Your account name should be displ﻿ayed beside the edit on the Recent Changes and Contributions section. but that meansfurther edit and chanegs to a wiki link originally made by someone will be given credit to the most previous editor. is there a way to permanently have us credited to a thread we started and further edits/changes be credited as "edits" in its changelog or something. i dont want to be making a whole guide and not be given any credit. wedont need to follow rms style, but its details should be very helpful to anyone. like the skills it uses, its counter element, items that it drops, the drop rate, anything abt it.